One of our longtime members, Rita Croteau passed away November 23, 2018. Rita contributed her time and talents to the theater community in many capacities. She was an excellent pianist, who played for rehearsals and numerous SLOC productions, as well as for other events. SLOC was her main theater home. She was a VP of Artistic for many years and wore many other hats. 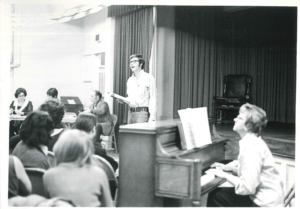 For example, Rita was thee Accompanist Chairman. Rita, along with her husband Paul, are on the Thelma Zeh Wall of Honor. Rita and Paul also were recipients of the Etta Moore Award. Both awards are a tribute to their love and dedication to SLOC. Rita, you will be missed!